“What, another scale book?” Bold words on the top of the back cover that clearly echo most players’ sentiment when thumbing through the method book bin. 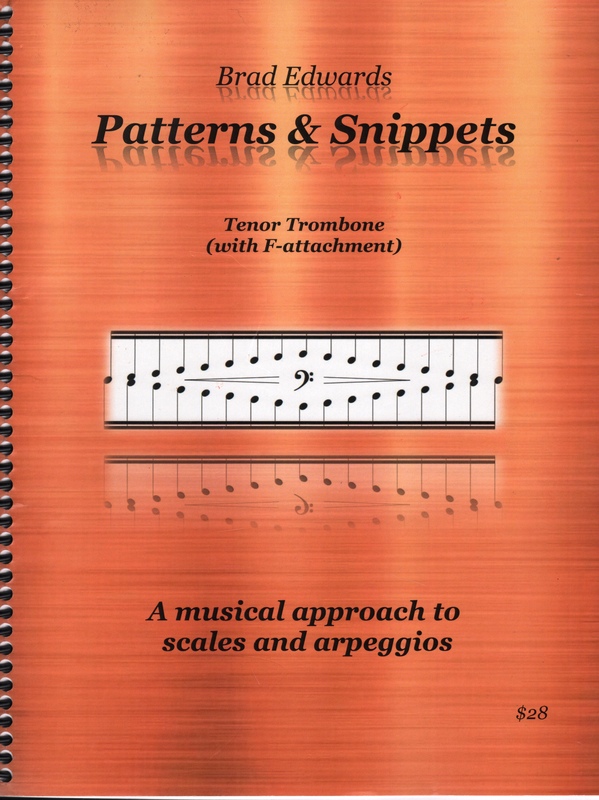 However, Edwards continues, “What if there were a book that presented patterns in a way that encouraged musicality while developing technique?” This book accomplishes this claim. Divided into three sections; melodic variations, stepwise sequences, and musical snippets, each portion is filled with a plentiful supply of source material. Few dynamics and tempi are given to allow the performer to make musical decisions based upon their technical prowess. Sprinkled throughout the text are words of wisdom, succinct practical advice, words of encouragement, and concise instruction. Similar to Edwards’ Lip Slurs book, not every pattern is written out. Initial sequences are given followed by indications to ‘flip’ the sequence up or down a half step. When combined with tenor/alto clef adjustments, every example has the potential to be played in all 12 keys. In several instances, patterns are explained and then goal notes are identified, leaving a skeleton on the staff for the player to correctly fill in. This requires an additional bit of thinking which is refreshing. Suggested levels of study are provided. Edwards states that these are not absolute, nor his intention, but they do give a rough idea of how the progressive difficulty can be mapped onto a calendar or curriculum. Jazz patterns and some of the more exotic scales are not included. Edwards observes there are other books available that already accomplish this. Almost every conceivable rhythm, tempo, phrasing, meter, interval, and articulation variation is included. Too, arpeggios and quartal passages are integrated. Edward’s excellent melodic creativity encompasses the gamut of scalar and intervallic patterns. If not his own melodies, first-rate material is used from all genres and instruments. Of particular helpful interest are the snippets modeled after famous trombone orchestral excerpts. As we have come to expect from Edwards’ publications, the book has an excellent layout, easy to turn pages, and attractive covers. In lieu of the drudgery of learning scales and arpeggios, I would assign my students to use every portion of this resource for study and jury. With little modification, this will work equally well for all low brass instruments.